After surviving an unexpected attack in enemy territory, jet-setting industrialist Tony Stark builds a high-tech suit of armor and vows to protect the world as Iron Man. 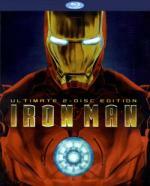 Straight from the pages of the legendary comic book, Iron Man is a hero who is built – not born – to be unlike any other! I first saw this in the theatre on a free preview ticket, and thought then that it was an amazing film. This makes my third re-watch, and it holds up excellently. It's still exciting, and funny, and easily holds a viewer's interest. It's filled with action but also with plenty of character development, at least in Stark. Downey Jr.'s magnificent performance carries the film, and I can't imagine anyone else in that role. Of course, the other thing that really makes this film great is that it treats it's source seriously. Yes, there's humor in the film - witty lines and accidents in armor development - but it's not a campy film. There's a respect for the comic medium behind it, and a lot of serious things to say about personal responsibility in one's business, in the film. That doesn't mean it isn't a fun film - because it absolutely is. It's a summer blockbuster superhero fun kind of film. But that also doesn't mean it doesn't have something to say as well. Bottom line - great film, lots of fun, smart enough to keep one sort of film fan interested while being filled with enough action and explosions to keep the other type interested. Highly recommended. Get the ultimate Iron Man 2 experience with this special edition loaded with bonus features that take you inside the suit, plus a digital copy of the film that you can watch anywhere, anytime! Now that Tony Stark's Super Hero secret is revealed to the world, he must once again suit up in order to face his most dangerous enemy yet – but not without a few new allies of his own! A sequel as good as its predecessor is a rare item. We have it here, however. Yes, compared to the original, there are definite flaws to this film. But there are also points where it is stronger, so I think they come out even. This is an equally fun, entertaining ride anchored by Robert Downey Jr.'s strong performance as Tony Stark. One definite improvement over the first film is in the villain. Mickey Roarke's Whiplash is a much more menacing, more more developed and nuanced character than Obidiah Stane. Sam Rockwell's Justin Hammer was equally much more believable in his motivation. I'm not fond of the recast of Rhodey, but I can live with it. I guess they wanted a bigger name for War Machine. If fighting Whiplash, or the government doesn't seem to take up enough time in the movie and leaves the movie floundering in the middle with no goal, as some reviewers seem to think, what they're missing is that Stark is always his own worst enemy. Yes, he is trying to discover a non-lethal power source, yes he does fight the government, yes he does have a villain to fight. But that's not what he has to overcome. Ultimately Stark has to face down himself, his own inner demons, and his own hedonistic tendencies to become a better person. That's Stark's goal, even if he doesn't understand it himself. Overall a great film, lots of fun, enough action to keep the explosion crowd entertained, easy recommendation you liked the first film. Looking forward to the next one since I never seen part 3! When Tony Stark/Iron Man finds his entire world reduced to rubble, he must use all his ingenuity to survive, destory his enemy and somehow protect those he loves. But a soul-searching question haunts him: Does the man make the suit... or does the suit make the man? Featuring spectacular special effects, Marvel's Iron Man 3 explodes with exclusive Blu-ray content, including a Gag Reel, deleted scenes, a never-before-seen Marvel short film and a first-of-its-kind, interactive Second Screen Experience app hosted by JARVIS! First let me say I enjoyed this film. I enjoyed it a lot. Now, I'm not a Marvel reader, except superficially, so the deviations from the comic don't bother me. I thought all of the actors did a great job, most especially Downey Jr, who is the heart and soul of this franchise and whom I am more and more impressed with every time I see him. I still don't like Cheadle's Rhodey as well as Howard's, but he's alright. He just doesn't seem to have the warmth Howard's portrayal did. I liked that Pepper had more to do in this film, and got a chance to be heroic. Overall, it's a good time to be had. 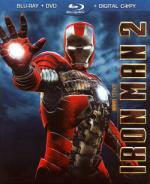 Now, I should probably say that this is the worst Iron Man film. You really don't see a lot of Iron Man, and certain scenes and plot points contradict established facts from the previous films. Other developments, particularly in the ending, are left unexplained. Yet, conversely, it's the best Tony Stark film. This is Stark's movie, not Iron Man's, and it's about Stark's character growth. If one ignores the issues with his stupidity at the beginning of the film - in giving out his address, calling out the bad guy, and not making optimum use of his tech (for such a smart dude, these are incredibly stupid choices for Stark) - but if one chalks that up to Stark's bravado and lets it slide, then one can appreciate the rest of his growth. How he owns his mistakes, how he comes to realize himself as the hero, he, Tony Stark, not Iron Man. And, really, that is the answer. Iron Man is just gear. Tony is always, has always been, the hero. Lots of fun, don't over-analyze the continuity problems and you should be fine. Recommended. I enjoyed all the Iron Man movies. I love Downey Jr as Stark. I did miss getting to see Tony do more in his lab/workshop whatever with his robot that messes up...or sprays him with the fire extinguisher. I do like that Pepper does a bit more. I know some people didn't like what was done with one character. I rather liked it. I certainly didn't expect that to happen, but I do think it works. Yep .. great set of films if you watch to enjoy.